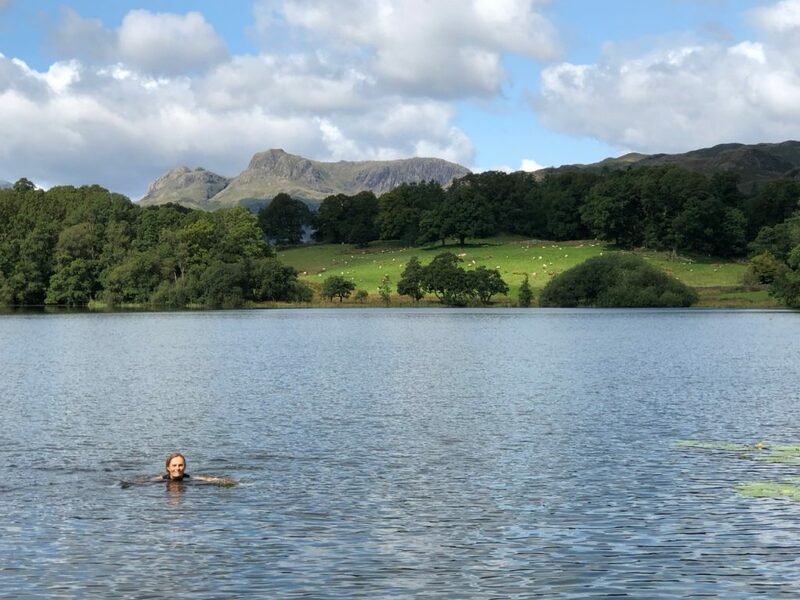 Wild swimming, breathtaking high and low level views, waterfalls (and incredible vegetarian food) … all in one day at Loughrigg in the Lake District. 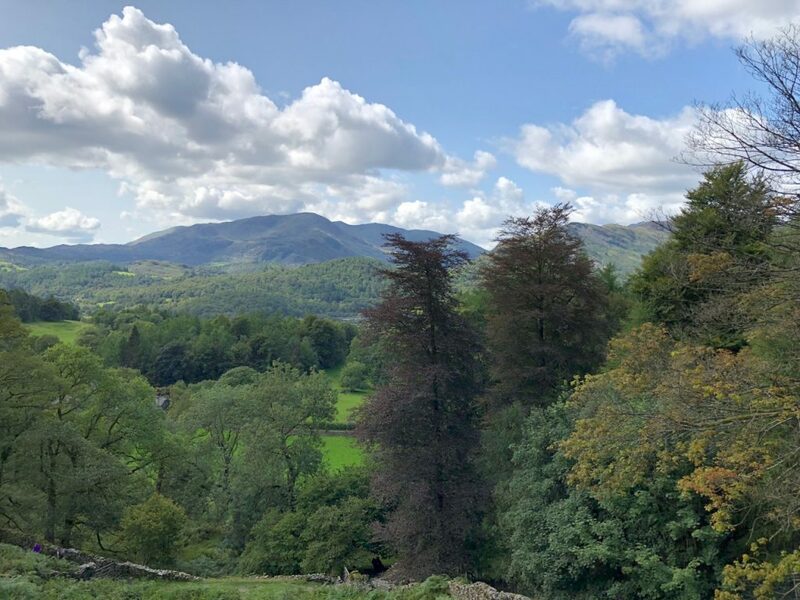 We parked our car at the Silverdale car park, which is located just outside the village of Skelwith Bridge on the road to Elterwater. It wasn’t cheap, but it served as a brilliant base for a day out to remember. 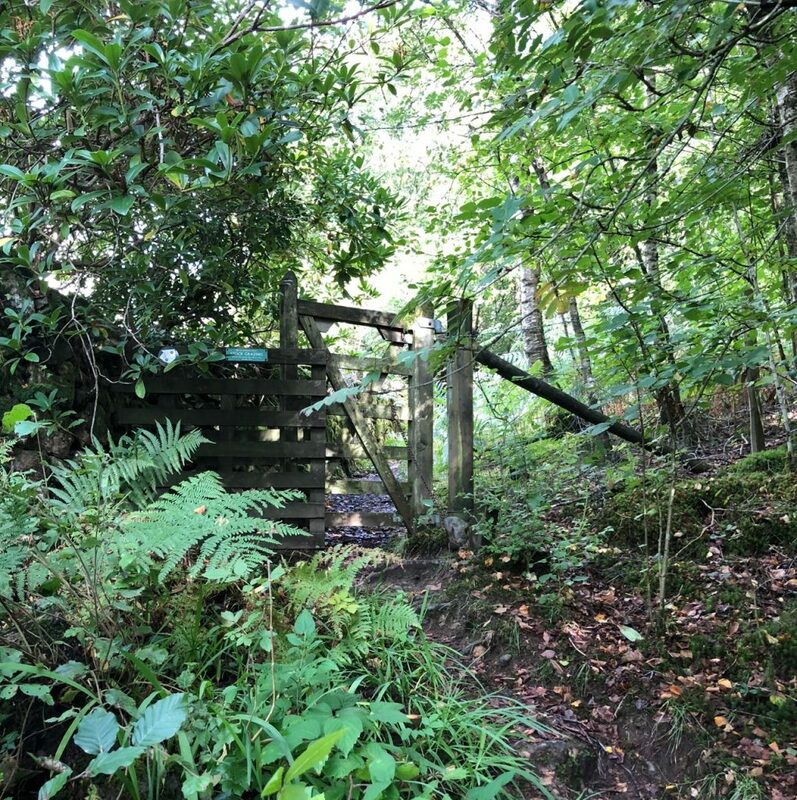 You can follow a footpath that starts at the entrance to the car par, it leads you across and then over a wooded slope. Within ten minutes the path meets a road which is dotted with pretty cottages. 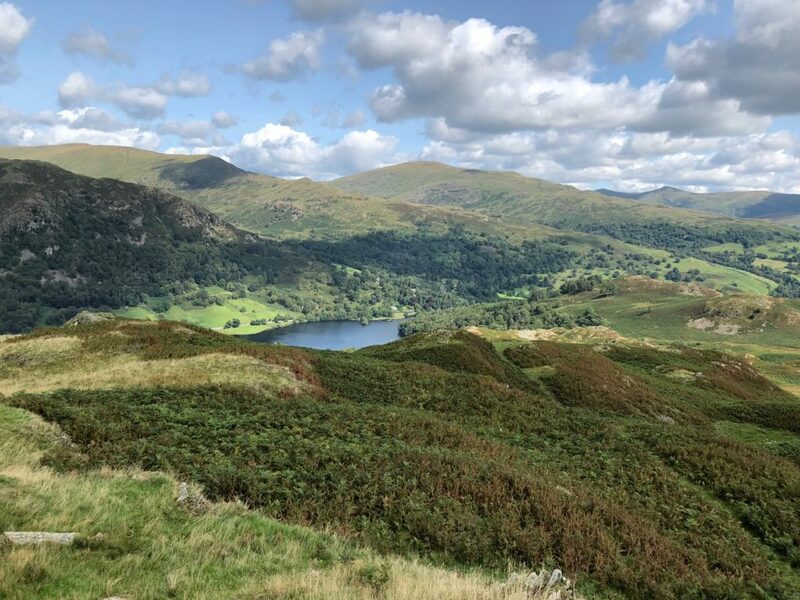 The landscape opens up and you can see Loughrigg Tarn below you and the knotted outline of Loughrigg Fell in front of you. Follow the road downhill and you see the footpath on your left that will take you around the Tarn. 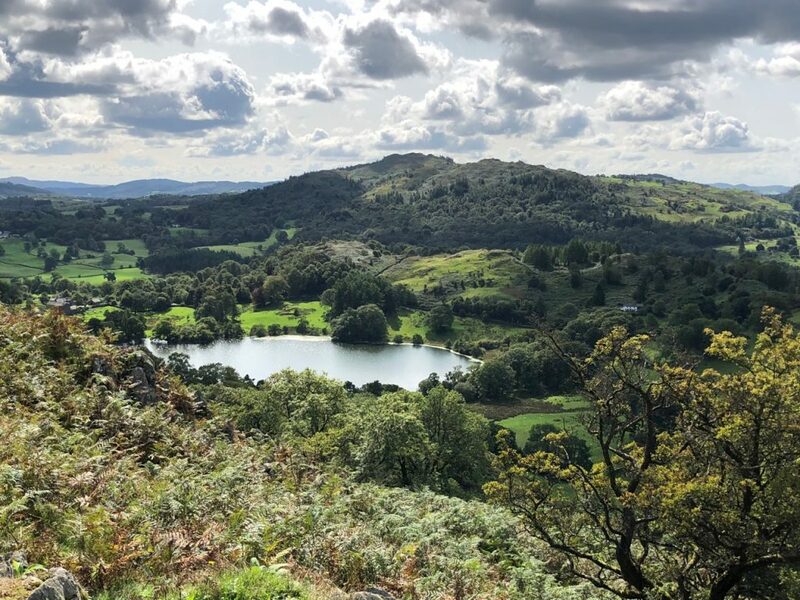 Loughrigg Tarn looks picture-perfect. Big enough to feel impressive, but small and intimate at the same time. We saw incredible wild water lillies, dragonflies and ducks that looked tranquil and content. … it was a swim to remember. We quickly changed on the shore. The cold lingered in our bodies even with several layers on. 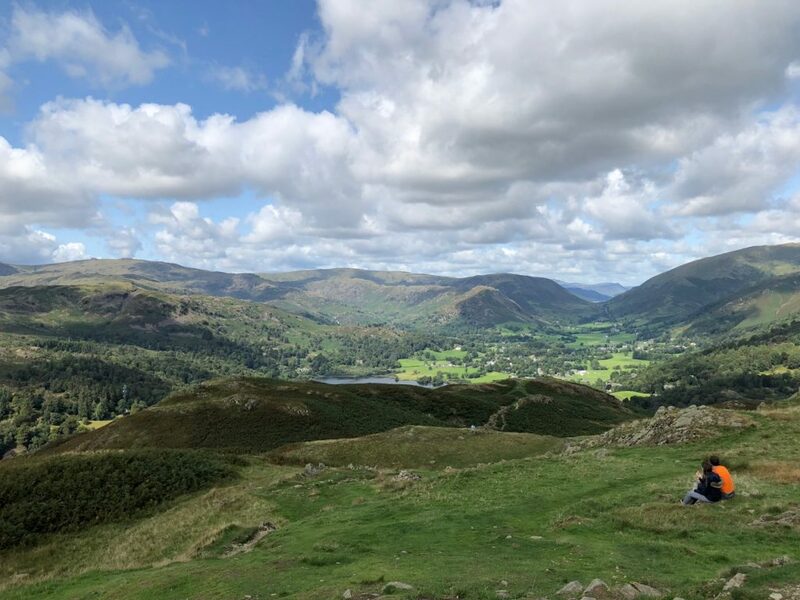 We decided to climb to the top of Loughrigg, partly for the view, and partly to warm up. Walking anti-clockwise around the tarn, we retraced our steps. At the northern point of the tarn we followed a pathway up across a grass meadow and onto a bridlepath. We turned right and followed the signs for Loughrigg summit. The path slowly skirted to hillside for five minutes before veering sharp right. The climb was now abrupt. Steps helped us gain height quickly. Getting to the top was surprisingly hard work. It took about half an hour (and several stops for breathers). What really took our breath away was the view from the top. 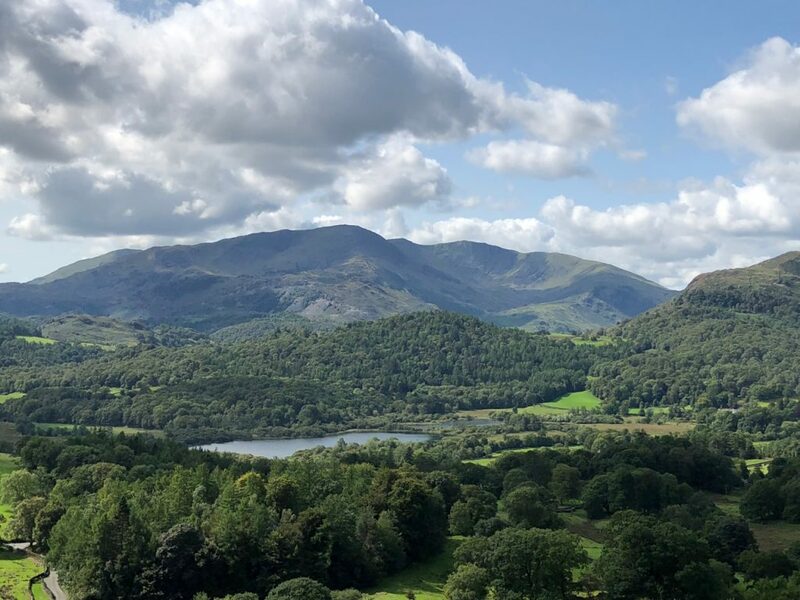 Loughrigg is not the highest peak. It’s only 335 metres. But it offers a fantastic vantage point. Looking northeast you see Grasmere and just the tips of Thirlmere in the distance. 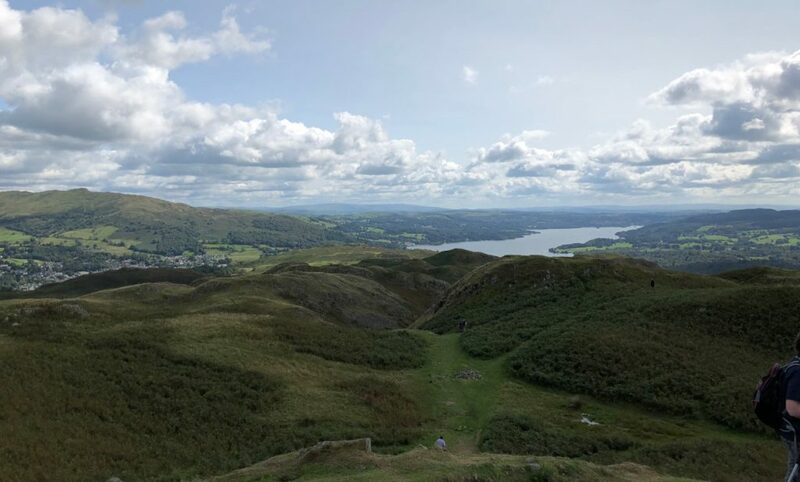 To the southwest is Elterwater and to the southeast the much bigger expanse of Windermere. 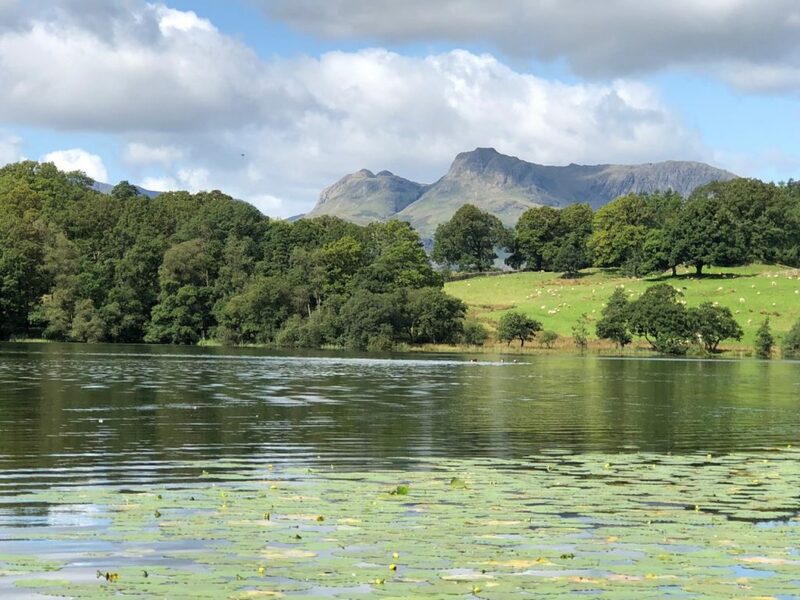 All these lakes are crowned by magnificent fells and mountains. 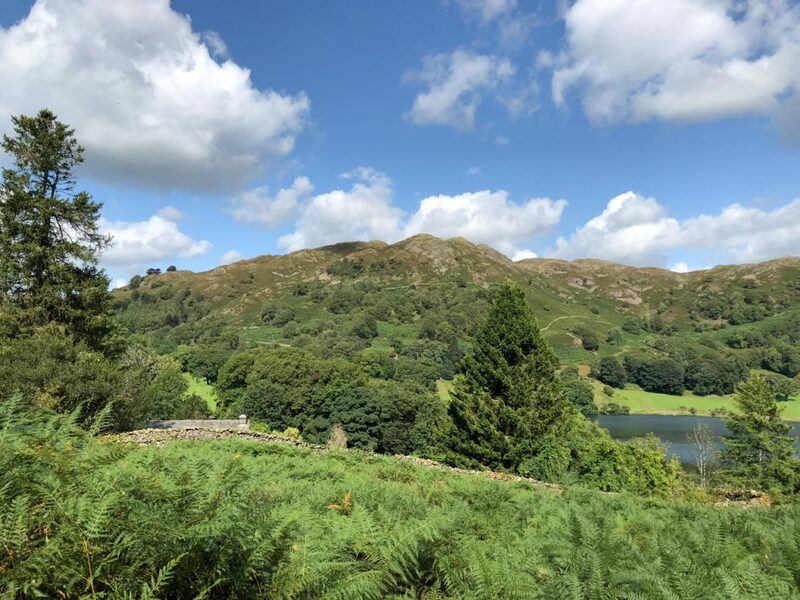 If you spend two minutes walking northwards, you will also get a great view of Rydal Water. We then descended using the same path. Although much easier on the lungs and legs, going down punishes the ankles and knees… you only now appreciate how steep the climb was. 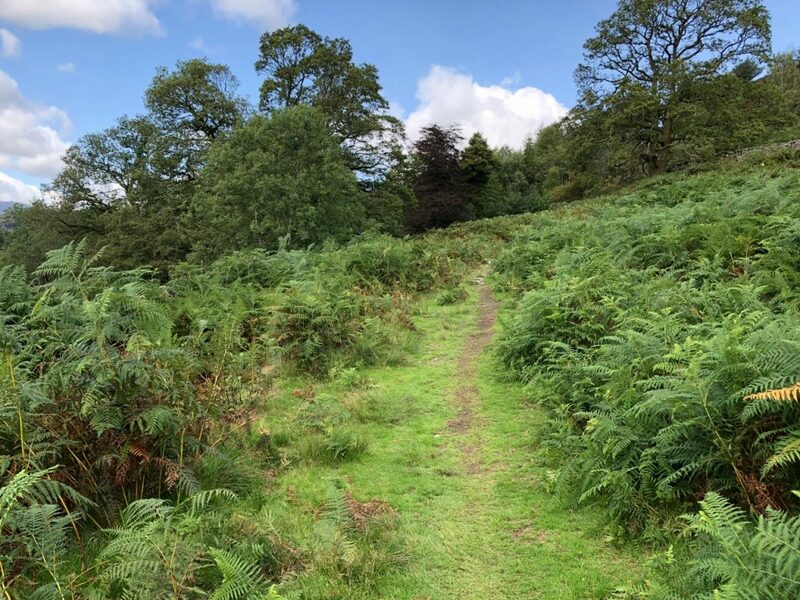 We soon picked up the path around Loughrigg Tarn again. We couldn’t resist another quick swim, before following the signs to the village Skelwith Bridge where we rested with delicious salads, pasties and cakes from Chesters by the River, a vegetarian café which has such a good reputation it only needs a very basic website. Suitably refreshed we then followed the path along the River Rothay, heading towards Elterwater. We passed the impressive Skelwith Force waterfalls. 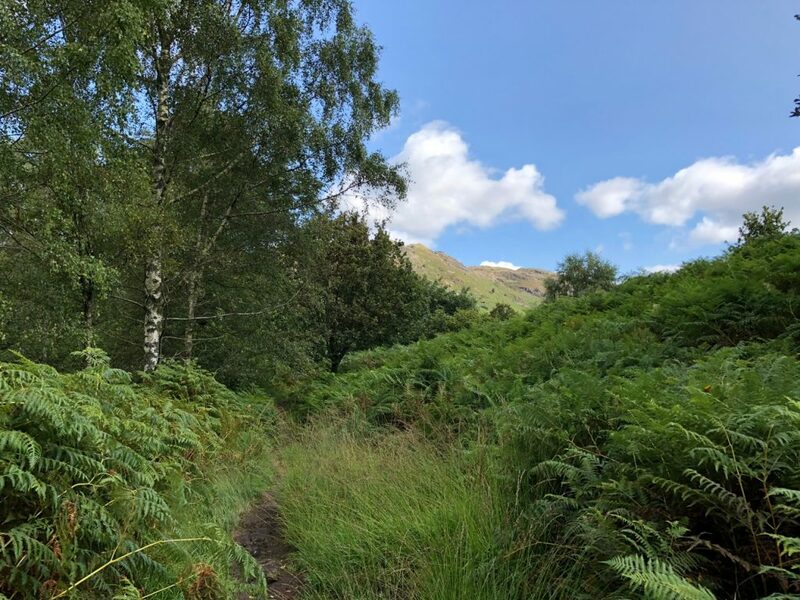 The pathway then opens up and you suddenly see Elterwater in front of you and the impressive Langdale peaks in the distance. 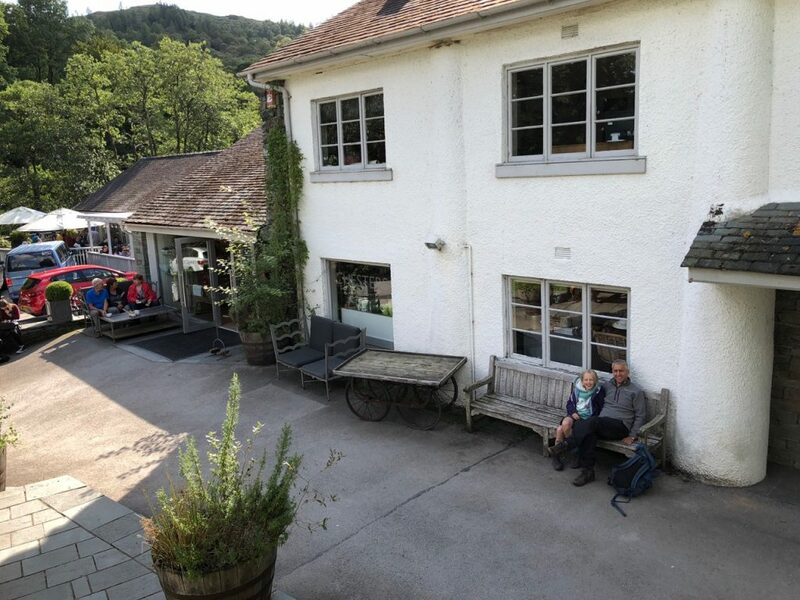 We could have walked to Elterwater and around the lake, a circular walk we have done previously. We cut our walk short and turned right onto the road. The car park was just a few metres further.